Communion Hymn, one of Mary Baker Eddy’s beloved poems known by congregations worldwide, is sensitively yet powerfully delivered by Susan Millard Schwarz, from a contemporary, traditional solo arrangement composed by Greg Granoff. Its timeless message reminds us of Jesus’s great gift to mankind: his selfless sharing of the power of truth through healing. Mrs. Eddy’s poem is a helpful reminder that this communion, symbolized by “the water, the bread, and the wine”, holds greater importance in its spiritual application than in the physical rituals associated with it. 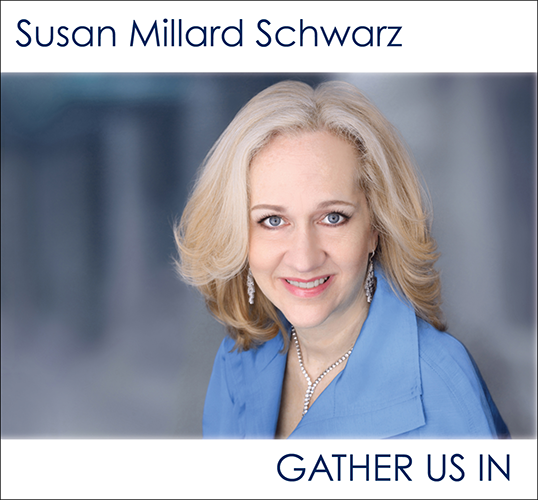 The song is off Susan’s album Gather Us In, a compilation of some of her favorite inspirational songs which include texts from a broad range of faith traditions. Susan Millard Schwarz is frequently hailed for her interpretive abilities as a fine vocal artist. Her musicality is revealed through her vocal warmth and exquisite color, and also the sensitivity with which she shapes her melodic lines. Lovely voice. Uplifting, inspiring words and music. Great beginning for my day! Thank you, Norma. Susan is a fine vocalist and Greg Granof, the composer, is certainly one of our best composers. Glad you’re happy with your choice!